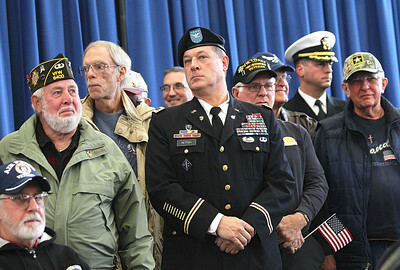 Candace H. Johnson-For Shaw Media Army Colonel Paul J. Hettich, of Antioch (center) stands with other veterans as they are recognized for their service during the Veteran’s Day Ceremony at the Public Works garage behind the Village Hall in Lindenhurst. Hettich just retired from the Army with thirty years of service. 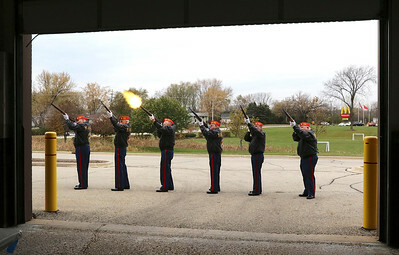 Candace H. Johnson-For Shaw Media A 3 Volley Salute by Lake County DET 801 of the Marine Corps League was presented during the Veteran’s Day Ceremony at the Public Works garage behind the Village Hall in Lindenhurst. 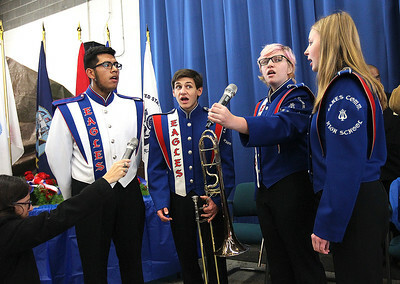 Candace H. Johnson-For Shaw Media Enrique Gomez, Jake Cozza, both 17, Evelyn Bridges and Anna Gondlach, both 16, all with the Lakes Community High School Wind Ensemble sing the National Anthem during the Veteran’s Day Ceremony at the Public Works garage behind the Village Hall in Lindenhurst. 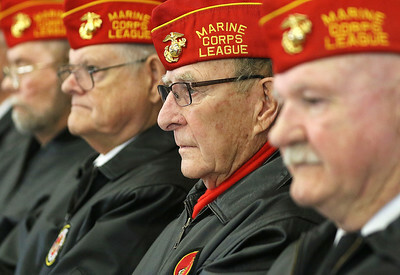 Candace H. Johnson-For Shaw Media Tom Mann, of Highwood, (second from right) sits with others from Lake County Detachment 801 of the Marine Corps League during the Veteran’s Day Ceremony at the Public Works garage behind the Village Hall in Lindenhurst. 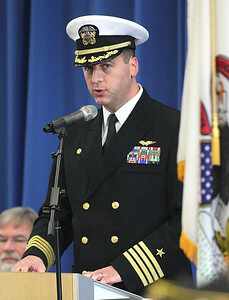 Candace H. Johnson-For Shaw Media Captain James D. Hawkins, Commanding Officer, Naval Station Great Lakes speaks to the audience during the Veteran’s Day Ceremony at the Public Works garage behind the Village Hall in Lindenhurst. 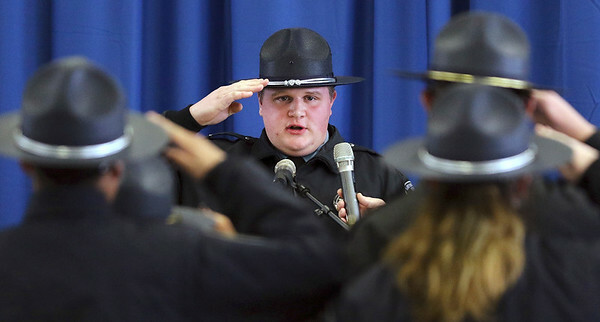 Candace H. Johnson-For Shaw Media Brandon Lindas, 19, of Trevor, Wis., with the Lindenhurst-Grayslake Police Explorer Post 2008 salutes for the Presentation of Colors during the Veteran’s Day Ceremony at the Public Works garage behind the Village Hall in Lindenhurst. 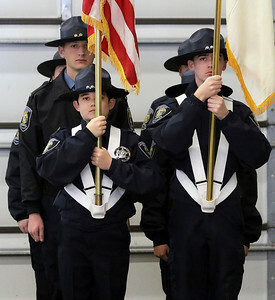 Candace H. Johnson-For Shaw Media The Lindenhurst-Grayslake Police Explorer Post 2008 Color Guard gets ready for the Presentation of Colors during the Veteran’s Day Ceremony at the Public Works garage behind the Village Hall in Lindenhurst. 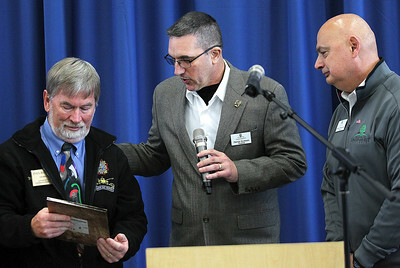 Candace H. Johnson-For Shaw Media Paul Baumunk, of Lindenhurst, chairman of the Lindenhurst Veterans Memorial Commission, reads the plaque he received for his dedicated years of service as chairman, with Patrick Dunham, trustee and Dominic Marturano, mayor of Lindenhurst, by his side during the Veteran’s Day Ceremony at the Public Works garage behind the Village Hall in Lindenhurst. 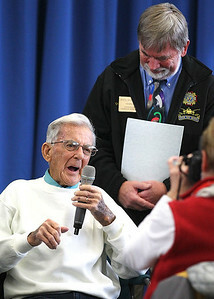 Candace H. Johnson-For Shaw Media Korean War veteran Frank Normoyle, of Gurnee, a Navy Corpsman, talks to the audience as he is recognized for his service with Paul Baumunk, of Lindenhurst, chairman of the Lindenhurst Veterans Memorial Commission, beside him during the Veteran’s Day Ceremony at the Public Works garage behind the Village Hall in Lindenhurst. 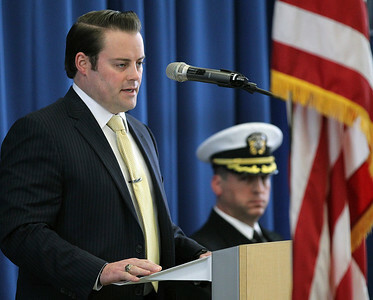 Normoyle has received a Silver Star, a Bronze Star and a Purple Heart for his actions during the Korean War. 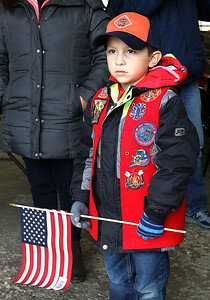 Candace H. Johnson-For Shaw Media Anthony Castaldo, 6, of Lindenhurst with Cub Scout Pack 84 watches veterans from Lake County Detachment 801 of the Marine Corps League after their 3 Volley Salute during the Veteran’s Day Ceremony at the Public Works garage behind the Village Hall in Lindenhurst. 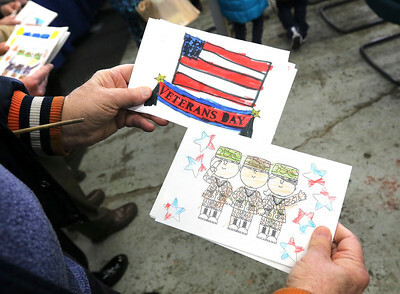 Candace H. Johnson-For Shaw Media Vietnam veteran Frank Tarczveski, of Lindenhurst, who served with the United States Air Force, holds Thank you cards given to him by students from the B.J. 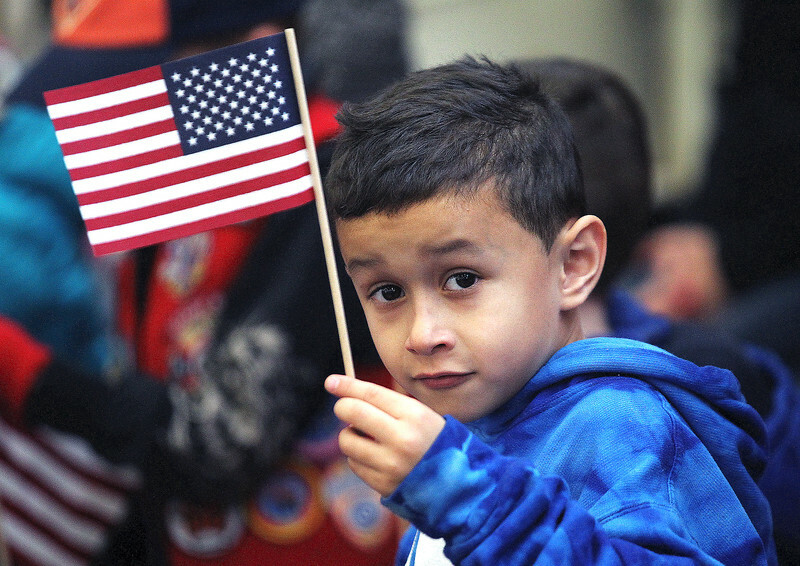 Hooper Elementary School during the Veteran’s Day Ceremony at the Public Works garage behind the Village Hall in Lindenhurst.